When power changes hands in a political game, many players end up getting caught up in the fallout. While the centre of gravity goes one way, it can overnight pull in the opposite direction. When this happens, some people end up falling into a political black hole. 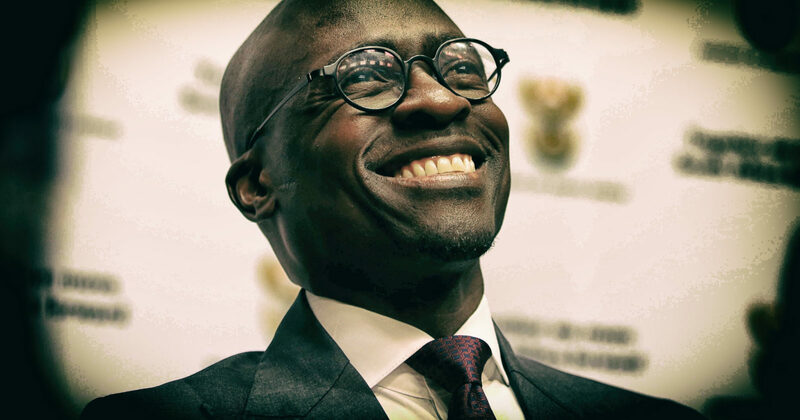 Over the last few days there has been some evidence that Malusi Gigaba, the Minister of Home Affairs, has been involved in several incidents which surely indicate that he is finding it difficult to maintain his public composure. It would appear he is busy falling into a black hole of his own making. There was a time, not too many years ago, when people spoke about Gigaba as future presidential material. The speculation was that Jacob Zuma would be President for 10 years, followed by someone like Nkosazana Dlamini-Zuma, followed by Gigaba. The idea was that it would keep KwaZulu-Natal in power for 30 years. And at the time, Gigaba seemed to be someone very much on the up. Even among other politicians he is incredibly quick, and very, very clever. He has some gifts that other politicians would love to possess, such as the ability to speak carefully and clearly while under the most intense stress, and to pick the right words to match the moment. His performance just hours after becoming Finance Minister following the removal of Pravin Gordhan from that position last year was proof. The picture appears to be rather different now. Last week Cabinet formally and officially decided to remove some of the regulations that he had championed around visas and the documents needed to bring children into the country. Gigaba had simply refused to back down when they were implemented, despite the obvious problems that they would create. Stories about children and their parents being refused entry into the country abounded, letters about how families with parents in different countries simply could not get the required documents in time to attend funerals were ignored. Even under the Zuma presidency, Tourism Minister Derek Hanekom was able to get some of the more onerous regulations removed. Now, the line has been pushed back even further. This surely proves that Gigaba was wrong, and those who complained about the new regulations were right. Once the decisions he made have been reversed, he cannot argue that he was correct and the rest of the world was wrong. Unfortunately, he appears to have simply refused to apologise, and has instead tried to muddle the picture as much as possible. Then there is the issue about whether Gigaba lied under oath. The High Court in Pretoria has ruled that he did. He has said repeatedly that he appealed against that ruling. But it appears the Constitutional Court has refused to hear the case and there is no available proof that the Supreme Court of Appeal will hear it. So, one of President Ramaphosa’s current ministers is a man whom a judge would describe as “a liar”. This is serious, because this same man must make decisions about who is allowed into the country and whether some people are given the fast track to citizenship (yes, Them…). Any president would be justified in taking action against a minister who lied under oath. What is fascinating about his tweet is not just that he claims he is capable of going “down” to her “level”. It is the fact that he has brought race into this. While it is not clear why he has done it, it does lead to an obvious question: Which “incorrigible racists” is he referring to, would he be prepared to name them, and how is race an issue here in the first place? But more than that, there is now a huge amount of attention focused on this issue. Twitter itself was ablaze with speculation about what would happen when a deadline he imposed for her to apologise passed. Eventually, he released a statement, on a Home Affairs letterhead, saying he was going to sue her for defamation. The risk that he runs by doing this is great. One of the elements of a defamation case is whether or not the person suing has a reputation to protect. This means that his entire reputation, including his alleged role in state capture, the naturalisation of the Guptas, and even aspects of his personal life (including the fact his wife claimed to have been involved in “helping” with Home Affairs decisions, while his alleged former mistress has said he was able to send a plane to fetch her) would suddenly emerge in open court. And then there are simpler questions he would have to answer: Why did he mention race in his tweet, what was defamatory about Tlhabi’s tweet, why did he bring in the visa regulations in the first place and continue to defend them when the Cabinet has now reversed them… the list is long. But, oddly, more was to follow. On Saturday night, at around 10:12pm, Gigaba suddenly said on Twitter that he was going to “devote the next hour” to answering the questions people may have. As journalist Ranjeni Munusamy noted on SAfm on Monday morning, the timing is important, as it came during a meeting of the ANC’s national executive committee. But there is still much that is odd about this. There are plenty of people with questions for Gigaba at the moment. And there are several forums available for him to do it. He could do as many radio and television interviews as he wanted, he could put his version on an affidavit, and he could have his pick of the Zondo Commission into State Capture, the Nugent Commission into SARS (as he was Finance Minister for a time) and there is a Parliamentary inquiry as well that he could enrich with his testimony. The fact he felt the need to communicate on Twitter may even have reminded some of the strange moment when Richard Nixon went to speak to students at the Lincoln Memorial just after invading Cambodia. His moves, coupled with his reaction to Tlhabi, may be an indication that he is at the point where he may feel that certain avenues are closing. Gigaba appeared at one point to be someone who would do Zuma’s bidding, and thus the Guptas. But there are complications even with that simple view. In 2015 then suspended SAA CEO Monwabisi Kalawe suggested in legal documents that Gigaba had been removed from the Public Enterprises Ministry because he had “spoken harshly” to then SAA chair Dudu Myeni. Myeni, as is now known, appears to have been a personal favourite of Zuma’s. So at the time, it is entirely possible that Gigaba had not behaved improperly in favour of Zuma, or the Guptas. Or simply did not know the true extent of Zuma’s relationship with Myeni (since then Zuma has denied that there was any “romantic relationship” between the two, while she appeared to have been involved in a bid to create a particularly dangerous situation at Eskom). As a result, it may be that Gigaba’s problem is actually that he followed the power at the time, in other words, he began to follow Zuma. Now, of course, power has shifted, and thus he finds this situation particularly uncomfortable. This is to be expected in some ways. He was seen first as someone who was in the Mbeki camp ahead of Polokwane, and then, it appears, to have got closer to Zuma over time. According to some, he did whatever Zuma asked, to the extent of preparing the boards of parastatals for the Guptas. This suggests that he is someone who follows power. As a result, when power shifts, he falls through the middle. Ramaphosa may now feel that he has sufficient reason to remove him from his position without fearing any adverse consequences. This is because the public image of Gigaba may be that he is corrupt; certainly the public support for Tlhabi may show that South Africans just don’t believe Gigaba.